A . Improving Health Literacy in Deaf American Sign Language Users. The Internet Journal of Advanced Nursing Practice. 2018 Volume 17 Number 1. The Americans with Disabilities Act (ADA) was passed more than 25 years ago in 1990. Despite the ADA legislation, multiple health disparities have been recognized among the second largest group of disabled Americans: the Deaf American Sign Language (ASL) users population. Deaf ASL users continue to experience barriers in accessing health information, accessing health care, and participating in research which limits abilities to achieve ideal health. Increasing health literacy in this population would assist in reducing barriers. Improving health literacy in deaf ASL users involves providing ASL interpreters with proficient health literacy, training health care providers including advanced practice nurses about deaf ASL users, and developing patient health education programs specifically for deaf individuals (i.e. ; utilizing native sign language, open captioning, images, and videos). Healthy People 2020 prioritizes the following goals: achieve health equity, eliminate disparities, and improve the health of all groups.1 However, the year 2020 is approaching quickly and health disparities still exist. One population who suffers from health disparities is the Deaf American Sign Language (ASL) users. One intervention that improves health literacy for deaf ASL users is utilization of an ASL interpreter with proficient health literacy.2 Several deaf interpreter organizations advertise providing ASL interpreters with proficient health literacy. Some primary care providers are proficient in ASL and serve larger populations of deaf ASL users than primary care providers who are not proficient in ASL. Technology has been utilized to enhance opportunities for deaf ASL users to increase health literacy. 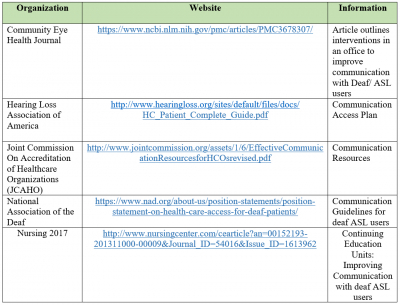 Several websites include health information presented with sign language, open captioning, images, and videos (Table 1). YouTube has some videos featuring health information that are tailored to the deaf ASL user community. Health information is also available for Spanish speakers and LGBTQIA (Lesbian, Gay, Bisexual, Transgender, Queer/Questioning, Intersex, and Asexual/Agender/Aromantic) individuals who are deaf ASL users. Advanced practice nurses can utilize interventions to improve health literacy in deaf ASL users. Pursuing learning opportunities online reinforces health provider education regarding this topic. Nurse practitioners should encourage deaf ASL users to communicate with family members regarding family history. Nurse practitioners can utilize deaf interpreters with proficient health literacy during appointments. Patient education can be reinforced with websites and YouTube videos that use sign language, open captioning, images, and videos. Deaf ASL users can be encouraged to participate with website development. Nurse practitioner education should include content as well as clinical opportunities with deaf ASL users. For example, in Arizona the state Commission for the Deaf and Hard of Hearing (http://www.acdhh.org/) is available for classroom visits and is willing to provide lectures for online courses. Arizona State Schools for the Deaf and Blind (https://asdb.az.gov/) offers clinical experiences, consulting, and is willing to provide classroom visits and lectures for online courses. Many states have organizations similar to these that provide similar services and support for advanced nursing education. Collaborating with other colleges or departments may offer opportunities for an interprofessional clinical simulation exercise for students to engage with deaf ASL users. Advanced practice nurses should consider opportunities to involve deaf ASL users in research studies. CBPR involves collaboration with deaf ASL users. Research studies that utilize ASL interpreters with proficient health literacy to interview deaf ASL participants or encourage participation in focus groups can be efficacious. Utilization of websites and study interventions that involve sign language, open captioning, images, and videos encourage deaf ASL user participation. Many health care providers do not use ASL interpreters and rely on friends or family with ASL skills, “lip reading”, or written communication. However, these interventions are not appropriate. These interventions do not promote communication with deaf ASL users and actually increase barriers to health care for this population. Interventions that improve communication with deaf ASL users have been presented in this article as a means to improve health literacy in deaf ASL users. Advanced practice nurses and other health care providers can utilize these interventions in striving to provide optimal health care and improved health outcomes for the deaf ASL user population. 1. US Department of Health and Human Services: Office of Disease Prevention and Health Promotion (ODPHP). Healthy People 2020. https://www.healthypeople.gov/. Accessed December 14, 2017. 2. Barnett S, McKee M, Smith SR, Pearson TA. Deaf sign language users, health inequities, and public health: opportunity for social justice. Preventing Chronic Dis. 2011;8(2): A45. 4. McKee MM, Winters PC, Sen A, Zazove P, Fiscella K. Emergency department use and risk factors among deaf American sign language users. Disabil Health J. 2015; 8(4):573- 578. 5. Smith SR, Chin NP. Social determinants of health in deaf communities. In: Maddock, J, ed. Public health- Social and behavioral health, (pp. 449 – 60). ISBN: 978-953-51-0620-3. http://www.intechopen.com/books/public-health-social-and-behavioral-health/social-determinants-of-healthdisparities-deaf-communities. Accessed December 14, 2017. 6. Kuenberg A, Fellinger P, Fellinger J. Health care access among deaf people. J Deaf Stud and Deaf Educ. 2016;21(1):1-10. 7. National Institute of Health (NIH). Community-based participatory research program. Retrieved from https://www.nimhd.nih.gov/programs/extramural/communitybased-participatory.html. Accessed December 14, 2017. 8. Cable News Network (CNN). Health illiteracy is costly and can be deadly. https://health.gov/communication/literacy/quickguide/Quickguide.pdf. Accessed December 14, 2017. 9. US Department of Health and Human Services: Office of Disease Prevention and Health Promotion (ODPHP). Quick guide to health literacy. https://health.gov/communication/literacy/quickguide/Quickguide.pdf. Accessed December 14, 2017. 10. 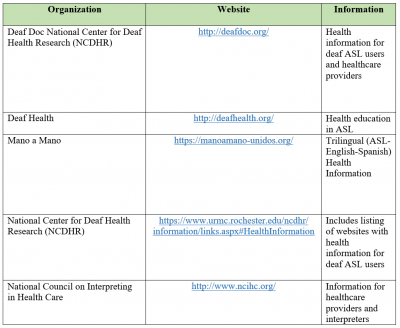 National Center for Deaf Health Research (NCDHR). Deaf Strong Hospital. https://www.urmc.rochester.edu/ncdhr/information/training/deaf-strong-hospital.aspx#What. Accessed December 14, 2017.